1. Preheat the oven to 160ºC, gas mark 3. Spray a large flameproof casserole dish with sunflower oil and cook the lamb in batches until browned. Remove and keep warm. 2. Cook the onions and carrots in the same pan for 5 minutes until the onions have softened. Stir in the flour and cook for 1 minute. 3. Return the lamb to the pan and stir in the Worcestershire sauce, stock and bay leaves. Bring to the boil, then remove from the heat. 4. Arrange the potatoes, overlapping, on top of the lamb and cover with a lid or foil. Bake for 1½ hours, then remove the lid. 5. Spray the potatoes with oil, raise the temperature to 220ºC, gas mark 7, and return to the oven for 15 minutes until golden. Serve with the peas. This traditional British recipe makes for a satisfying Sunday centrepiece the whole family can enjoy. The secret to success is to not repeatedly open the oven door while the hotpot is baking, but to leave it be and keep the temperature even. 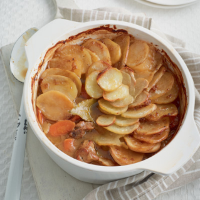 For extra flavour, try adding diced swede or parsnips with the carrots.